....."Cats would be a lot more fun if you could teach them to do something." I'd like my cat to tidy the house and defrost dinner. My friend would be happy if his cat could do some sort of trick. It can be done. At her home in Sarasota, Fla., Marlene, 2, a striped alley cat sits in a miniature circus wagon, listening for he musical cue. Suddenly her owner, trainer and first love, Dominique Lefort, 44, pulls the wagon center stage actually the middle of his back yard. On cue, he opens the door of the wagon. A cat's paw pokes out. With one carefully aimed claw, Marlene pops a balloon right in front of her nose. Then, on another cue she leaps from the box, lands on a stool, rises up- not just sits up, but gets way up there- and stretches out her paws in a motion that all but screams. Out spring five leggy, half grown kittens. They fly across the yard, and each hops onto its own stool. Then with just a bit of coaxing, five little cats stand up, way up, and wave. Ta-da! This cat school, and these cats- Mars, Sharky, Spot, Piggy, and Charlene- are in training for what Lefort, a former actor and mime, hopes will be the greatest little cat show on earth. A couple of years ago he decided the world needed a great trained housecat act. He bought Marlene in a Montreal pet store and without any special knowledge of animal behavior, taught her routines. This year Marlene and Lefort will fly 50,000 miles to perform at parties, cat shows, and mall openings. This is no gimmick act filled with slick tricks. As a stranger with no food with which to bribe Marlene, I walked up to her and asked her to sit up. She sat. I asked her to spin. She spun. We did it again. There's an old saying in Hollywood: if you need six cat tricks in a movie, get six look-alike cats and teach each one a different trick. As one Tinseltown animal trainer says, "Cat memory is a funny thing. We have a roll-over cat. It's the one we send whenever anybody needs a cat to roll over. It's a smart cat, and knows other tricks. But whenever it gets stressed out on the set it just keeps rolling over." Lefort is of a new school. "Each animal must do every trick," he says. "one must have infinite patience, and work with the cats about four hours a day. I reward them with food from time to time, which one must, and I never hurt them." This isn't to say he doesn't raise his voice. Each of the kittens, during morning class, responded promptly to its name. "Good, Mars. Now up, Piggy. Higher! Charlene, are you asleep? Up. All the way up! 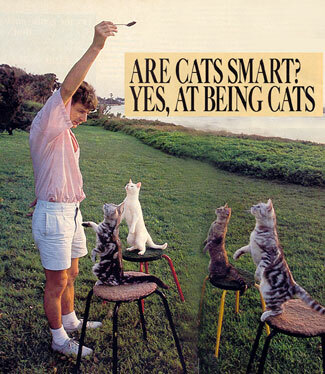 "I make them do a sort of exercise," Lefort says, coaxing his kitties to do the feline equivalent of deep-knee bends. "It's to strengthen their back legs and improve their balance. ...Charlene! Please! Up! I'm afraid though in every group there's a dumb one. Here, it's Charlene." Piggy, however, is showing how smart he is. It's hoop-jumping practice, and he scurries up a stepladder, runs along a gangplank, leaps up, arcs through a hoop, and lands on a four-inch-wide carpeted board five feet away. He climbs down the landing ladder, races up the take-off ladder, and completes the trick again and again, until he has done it 30 times. Once he missed the landing board and toppled to the ground. He gave himself three embarrassed licks and scooted back up the ladder. I loved him. I loved them all. While I was watching the kittens, the old pro Marlene sat down beside me. Without thinking, I moved a can of cat food on the bench. Marlene looked at me, stood up on her hind feet, turned in a circle, and sort of bowed. "Do you think," I asked Lefort, "that my cat could learn these tricks?"